I’d have to say I agree with Fran Bailey’s comment, the analysis seems entirely too optimistic. Firstly, the post says we are on track to limiting CO2 to 450ppm, thus giving us ‘likely’ or >66% chance of staying within 2°C warming. Here’s the table from the last IPCC report from my post IPCC Synthesis Report: you’ve been told! 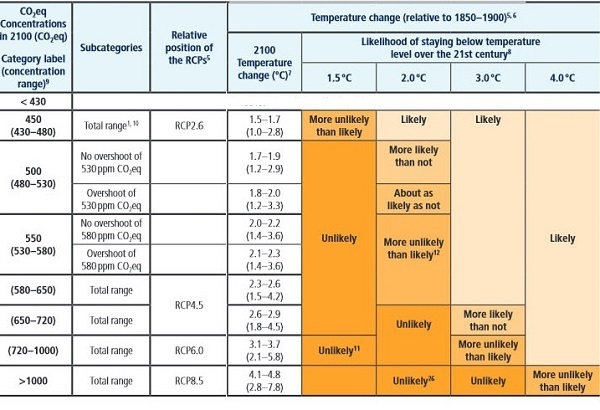 The table comes from the IPCC Working Group 3 report. I’ve adapted it by taking out four columns (relating to quantums of CO2 and emissions reduction targets for 2050 and 2100) to highlight the broad relationships. 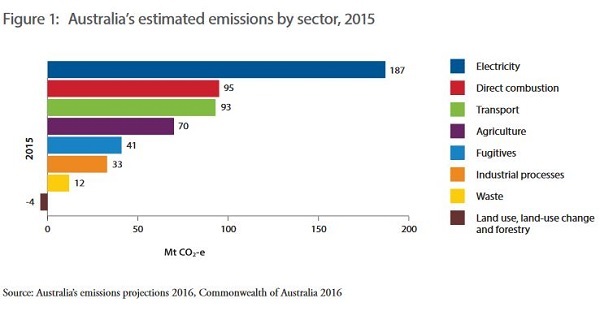 Here I will just note that the ppm concentrations are cited as CO2e, not CO2, which means adding the equivalence of the ‘Kyoto six’ GHGs (methane, nitrous oxide and such). 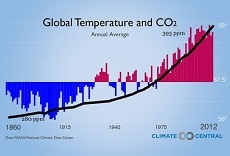 Generally speaking, CO2 represents about 80% of CO2e. So take 410, divide by four and add it in your head, and you will readily see that we are probably in the 500 CO2e zone already. Brian Kahn at Climate Central says We just breached the 410 parts per million threshold, and if we carry on like that we’ll get a climate state unseen in 50 million years. Yes, I know, we’ll do something about it and our kids will come up with some new technology if we don’t. But that is our legacy. 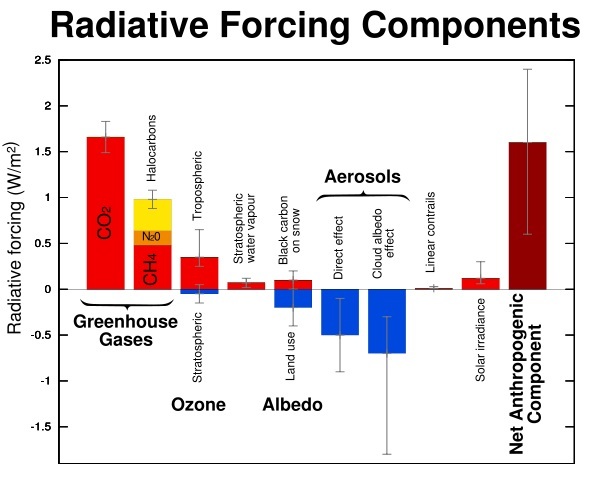 The IPCC indicated in its fourth assessment report that achieving a 2 C target would mean stabilizing greenhouse gas concentrations in the atmosphere at around 445 to 490 ppm CO2 equivalent or lower. Higher levels would substantially increase the risks of harmful and irreversible climate change. The fourth report was in 2007. Indeed the fifth Science Working Group report was in September 2013, probably based on published papers six to nine months earlier than that. Most research can itself take some time to publish, so we are due for a refresher. That came from my post The game is up. It’s one of the scary posts I list at the end of The folly of two degrees, which you can always find at the Key posts page from the LHS side-bar. I hope and pray that the above is alarmist and wrong. 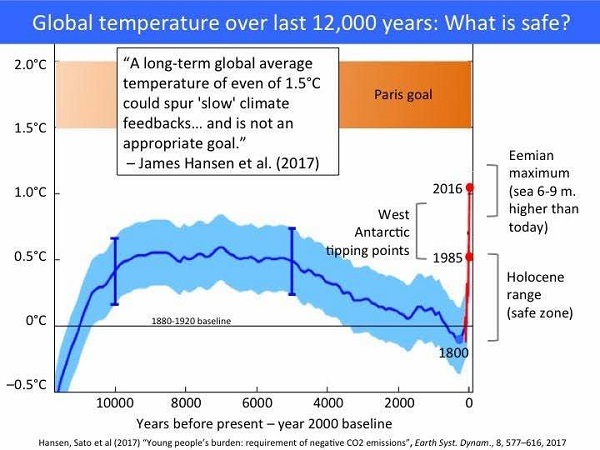 However, Climate Central is a serious site, the first Kahn linked article was republished in the Scientific American, and Spratt realised before James Hansen did in 2007 that we’d have to get back below where we are now – he said 320ppm. 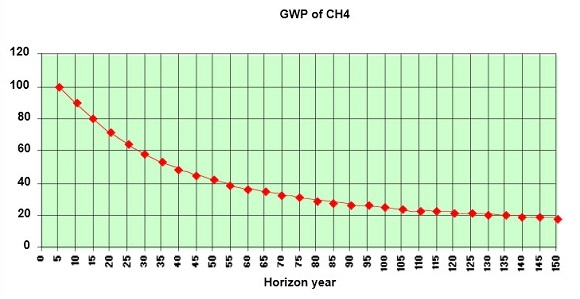 Most estimates of CH4 forcing put it at something like 23 times that of CO2 over a century. My understanding is that climate models don’t include the increased effect from the first 100 years, they just use 100-year number, reflecting the more or less permanent effect. I’m not sure how much difference that makes, but it no doubt would make the mitigation task a bit harder. In googling the only article of significance I turned up was this 2012 paper. It’s focus is on economic damage, if I’ve got it right, which it calculates as 23.4 times CO2, similar, it says, to the global warming effect. So at that time the physics was still the same. I’m not sure the problems of ruminants is easily solved. Last night on ABC RN’s Future Tense program Rebecca Huntley looked at the future of food under climate change starting with the main ingredients of spaghetti bolognese. The inconvenient truth is that the ruminant problem would remain to some extent, and, further, that emissions from agriculture will increase even as emissions intensity is reduced in individual activities. The assumption is that the increased food required to adequately feed the billions will outbalance any emissions efficiency gained. So the experts consulted said. What does the 350ppm goal really mean? Bill McKibben asked me what should be the target for CO2. He was going to form this organization, 450.org, and that’s when I told him, hold on, what I’m finding is that’s actually a pretty dangerous level. So he did hold on for a while. So what should humanity aim for? It’s not any larger than 350 ppm, and it might be less. It just turns out that if you look at the paleoclimate, it’s really very sensitive. 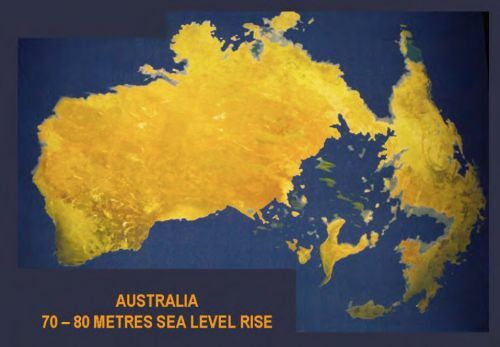 Hansen gave his answer in an informal meeting at the American Geophysical Union conference in December 2007, as newly elected minister Penny Wong was representing us at the Bali conference of the UNFCCC, a turning point of sorts in our climate change politics. So 350.org was born. 350ppm is not the official aim of the UNFCCC or anyone, but is steadily gaining currency. 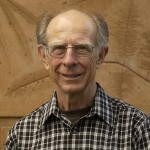 Hansen subsequently (2008) wrote a paper with some others. In it he makes clear that GHGs other than CO2 are currently roughly squared off by aerosols, which stay in the air up to perhaps 15 years. Later and in his book he makes clear that 350ppm is valid only if that net result of other forcings remains at zero. So his 350 CO2 is approximately the same as 350 CO2e. It’s clear that if we get rid of the aerosols, and the cities of China and India can breathe again, the task becomes harder. I have never seen a number for pre-industrial CO2e, but if 280ppm is 80% then 100% is 350ppm. I once wrote at Quiggin’s that my mother taught me to put things back as I found them. Unfortunately confusing CO2 and CO2e is not uncommon when climate scientists are communicating. Climate Code Red, the book was expanded from an online paper The Big Melt by David Spratt and Philip Sutton, published in 2007 in response to the then record Arctic sea ice record. They chose 320ppm, and addressed the tricky problem of what you do when you stop burning coal and lose the short-term protection on aerosols. They say that the large ice sheets become destabilised when you cross the 300-350ppm zone, so anything beyond that is dangerous. Hansen has a similar view, supported now by much published research. By the way, the American Geophysical Union is a really big conference. The organisation consists over 62,000 members from 144 countries. Climate Code Red says 15,000 of them heard Hansen’s announcement. So they were told. Dana Nuccitelli reports on a study that shows our Paris carbon budget may be 40% smaller than thought. It is about the fact that the pre-industrial temperature back in the 18th century was lower than the late 19th century temperature normally used as a base. Two comments. Firstly, many scientists still think in spite of what Hansen said in 2007 that we still have a budget of burnable carbon. Secondly, there is a paper out (I’ll have to look for a link) that says we were heading out of the Holocene and back into an ice age before industry took off in the 18th century. Late 19th century temperatures will do me, reflecting more accurately the Goldilocks temperatures of the Hoplocene. Electricity and transport are the low-hanging fruit. One ray of light – the Taiwanese have worked out how to sequester the carbon produced from making cement, which no doubt contribute to the industrial processes sector, and make heaps of money in the process. 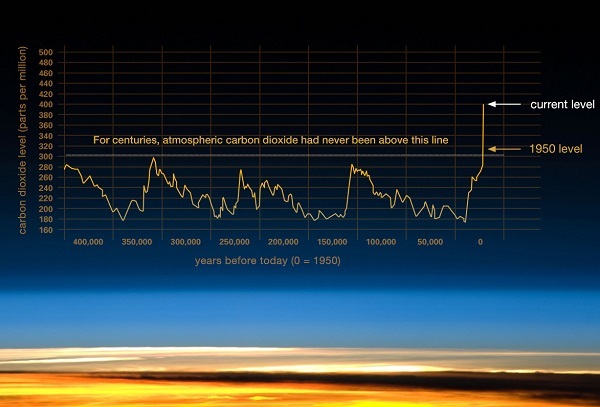 Seems the temperature has been on the slide for the last 5000 years. In 1985 we reached the Holocene maximum, and now we are temperature-wise where the planet was during the Eemian, the last interglacial, when the sea level was 6-9 metres higher. However, the CO2 level as seen in the NASA graph in the post is way above that, so warmer temperatures will ensue, given time. The paper suggests that 320 ppm may be where we should head, but they reaffirm 350ppm as the initial goal. Much of the paper is devoted to what we must do. Proposed methods of extraction such as bioenergy with carbon capture and storage (BECCS) or air capture of CO2 have minimal estimated costs of USD 89–535 trillion this century and also have large risks and uncertain feasibility. They suggest reducing emissions by 6% pa from 2021, and then removing about 150 gigatonnes of carbon from the atmosphere by 2100. They seem to be keen on enhancing soil carbon. Elsewhere, China has announced that it plans to cover a quarter of the country with trees by 2020. They are aiming for an “environmental civilisation”, living in harmony with nature. That would be a change, but welcome nevertheless. Update 2: I’ve found a paper Shindell and Faluvegi (2010) The net climate impact of coal-fired power plant emissions. The effect of aerosols from coal-fired plants is considerable but tends to concentrate around the regions and latitudes where it is generated. 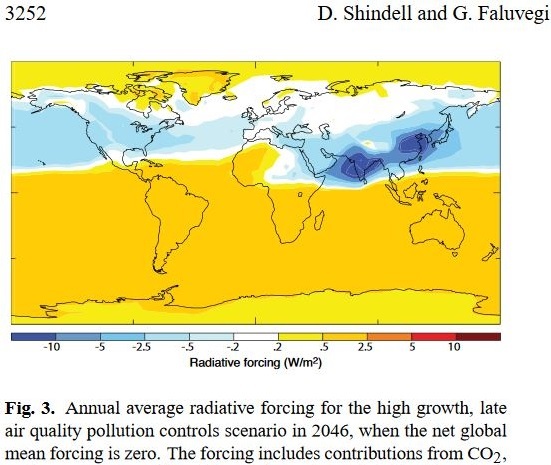 This graph is based on forward projections to 2046 in a scenario where global mean radiative forcing is zero. In this scenario residual GHG forcing is balanced by the negative protection from aerosols, assuming that dirty emissions from coal-fired power are not filtered out. If filters are applied, we’ll have to go harder on GHGs, and India and China, plus to some extent the NH mid-latitude zone will be warmer. This differentially affects the zone where most of the world’s food is grown, and may have other implications. Obviously policies have changed in India and China since the article was written, but it gives some idea of the magnitude of the aerosol problem. This piece from Andrew Glikson provides interesting perspectives on the Holocene temperatures within the broader sweep of the geological record, but I don’t think it’s the item I was looking for that I mentioned in the post. I’ve just done an update on the post about David Spratt’s post on a new paper by Hansen et al. It’s brilliant, and tells us what we must do. Difficult, but not impossible. Fran Barlow used to post on LP. Yes, Ambigulous she did, and I miss her. I’ve put in another update (below). Sorry to be a bit obsessive about this, but i believe we need to be clear-eyed about what the true situation is.